Great content is well-written content. You have only a few seconds to grab your reader’s attention. That is not easy. Fortunately, several free and low-cost tools can help you write clear, coherent and compelling content. Here are some of my favorites. Get a PDF version of this post here. 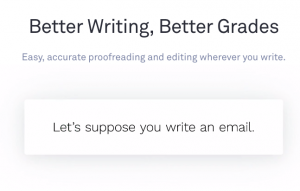 Grammarly’s goal is to “make sure everything you write is clear and effective all the time.” This online tool checks for grammar, spelling, passive voice, and the like. It gives you a rating so you can get a sense of how you’re doing. Here is a sample of a Grammarly edit. The tool lets you “step” through the options, and accept or ignore its suggestions. I use this tool to review polished drafts, when I’ve become too familiar with the material to look at it objectively. The free version checks for “critical” grammar and spelling errors. The premium version, which has much more functionality, costs as little as $12 a month. 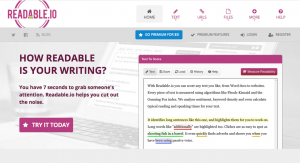 In addition to the online text editor, Grammarly offers a free browser extension, which corrects critical writing errors. The extension is available for Chrome, Safari, Edge and Firefox. The tool highlights the words and sentences it wants you to correct. 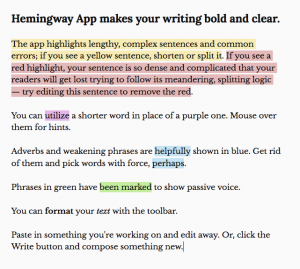 I like the fact that the Hemingway app provides so much feedback so quickly. I read through the summary on the right, and cross-check the items that need attention. The online version of this tool is free. The desktop version (as of this writing) is under $20, with free upgrades. This tool measures the readability of content using respected algorithms like the Flesch-Kincaid readability test, which grades how understandable your content is, and gives it a score between one and 100. A conversion table interprets this score and correlates it to a grade level, which suggests the lowest level of education needed for someone to easily understand the material. 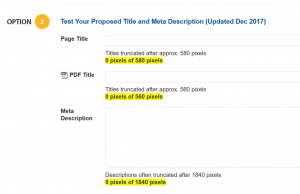 Then the tool suggests ways you can improve the content. A high score means the content is very readable, which usually correlates to a lower level. For example, a score of 70 to 80 is equivalent to about a 7th grade reading level. In general, the goal is to write comfortably below the grade level of your intended audience. Here is Readable’s feedback from an earlier draft of this post. I got a good grade. However, the system suggested I replace some long words with shorter ones. The service offers a free trial. After that, prices range from about $4 to $70 a month, depending on the number of features and logins. Here are guidelines to translate some of these numbers into valuable advice. Total number of words: Divide this number by 200 to get the number of minutes it will take to read the material. Sentences per paragraph: Aim for three sentences per paragraph for both print and online. Words per sentence: Make your sentences as short as possible (and reasonable), for greater comprehension. Flesch reading ease: Target a score of 50 or higher. Flesch-Kincaid grade level: Target about four years under the typical education level of your audience. Learn how to activate the readability index here. 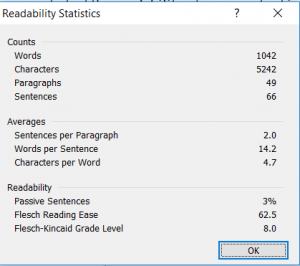 Once you have activated the readability index, the statistics will automatically appear after you’ve run spell checker in Word. 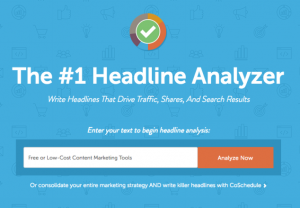 Fortunately, CoSchedule Headline Analyzer shows you which headlines are more likely to drive traffic, leads and sales. 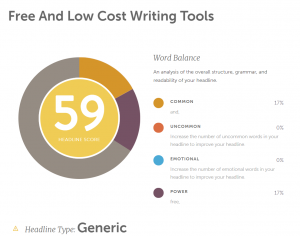 This online tool looks at factors like your headline’s word balance, length, the first and last three words, and overall sentiment. It also gives you a preview of how the headline would look in a Google search so you can see how your content will appear to readers. I used it on an earlier version of the title of this blog post: “Free and Low-cost Writing and Editing Tools.” My score was disappointing. By trial and error, I added the words “seven” and “best” to create the title “Seven of the Best Free and Low-Cost Writing Tools.” My score went up 16 points, to 75. 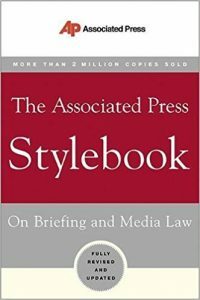 This comprehensive reference manual will help you master grammar, spelling, punctuation, capitalization, edit with clarity and professionalism. It is available at Amazon and other booksellers in both hardcopy and digital form. If you don’t write content for websites, you can skip this section. Technically this isn’t a writing tool, although it does impact writing page titles and meta descriptions. These are important for search engine optimization (SEO) because they help determine which information the search engine will display in response to a search inquiry. The challenge is that Google measures pages titles and meta descriptions by pixels, not by characters, making it more difficult to know how much of your content will be displayed. This tool simplifies that process. Write or paste the draft into the form, and it automatically calculates the number of pixels and shows what information would be displayed. I encourage you to test out these tools and see what works the best for you. You’ll get more readers, and they will thank you.